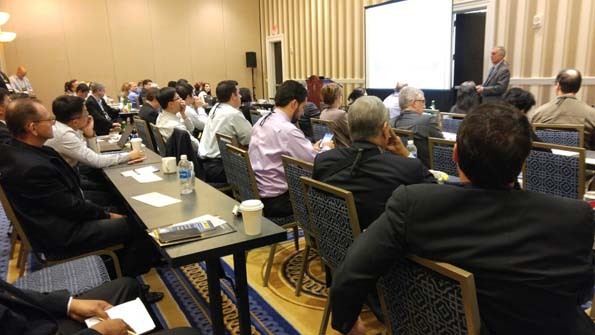 The 54th R&D 100 Awards & 2nd Annual Technology Conference was held on November 2-4, 2016 at the Gaylord National Convention Center, just south of Washington, DC, in Oxon, Maryland. The leaders of R&D Magazine, the flagship publication of Advantage Business Media’s 10-magazine Science Group, coordinate the Awards contest and dinner each year. This year, 52 judges from industry, academia, and government reviewed a gazillion submissions and determined there were 275 Finalists. Then, they culled-out the 100 Winners. Plus, 15 Special Recognition Awards are part of the ceremony each year. In all, some one-hundred fifteen winners are presented awards at an engaging black tie dinner event. Every innovation professional should witness this at least once in their career. There are six categories: Analytical/Test, IT/Electrical, Mechanical/Materials, Process/Prototyping, Software/Services, and Special Recognition. Examples of Special Recognition Awards include: Corporate Social Responsibility, Green Tech, and Market Disruptor. 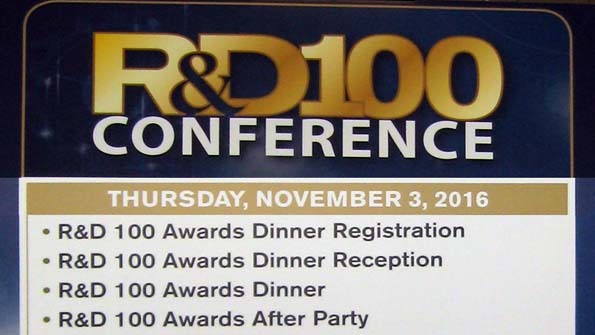 The full list of 2016 R&D 100 Award Winners is available here: www.rd100conference.com/awards/winners-finalists/year/2016/. It is hard to keep track of it all during the dinner. The individual inventions are fascinating and fully captivate your attention, one after the other, and all of a sudden the evening is over. So, here are some observations at fifty-thousand feet from putting the table from the URL in the preceding paragraph into Excel. 2) Other than Dow, the only other industrial or high-tech company to win more than one award was PPG Industries which won two. 3) USA’s National Laboratories also deserve comment. Approximately 30 of the awards went to one of the National Labs or to a dedicated USA government lab. 4) Not enough industry and high-tech companies are competing. I’ve recommended to our clients over the years that it is really inexpensive to compete in this contest and one can’t beat the visibility, free marketing, and brand value. If you are a big company, there is real bang for the buck to be a Finalist – never mind winning. If you are a start-up, the visibility could accelerate the company by 3-5 years. The Innovator Of The Year Award, this particular year, recognizes a technology that might benefit us all. Dr. Anthony Atala, Director of the Wake Forest Institute for Regenerative Medicine, and his team are making great progress on growing human organs that work. The more vessels and “piping” that is in an organ, the harder it is to grow. But, some major organs (such as the liver) have large areas of very similar cells that perform the function of the organ. Dr. Atala is now within sight of being able to consistently grow the “mass areas” of several organs, possibly within this decade. 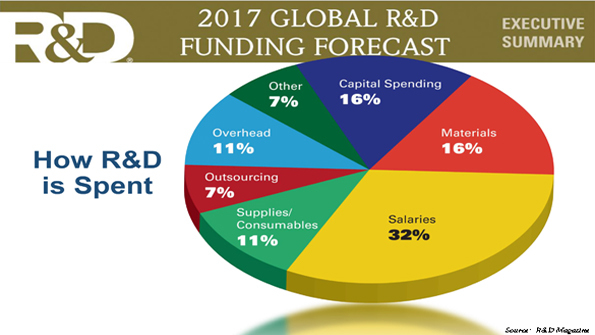 The 2017 Global Funding Forecast was presented in DRAFT form after the Awards Dinner concluded. Only the DRAFT form is currently available. The final version should be out later this month or in early February. 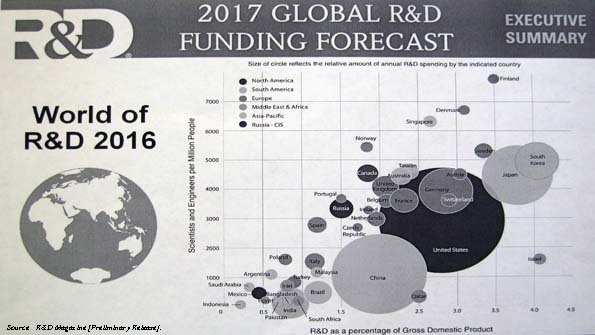 R&D Magazine is one of the best sources of R&D Spending information presented in a global business context. Each year, a preview of the coming year is presented. Historically, this was developed by R&D Magazine in conjunction with Battelle Laboratories. As of last year, this is now developed in conjunction with the Industrial Research Institute [IRI]. This was a natural alliance as the IRI has been developing a similar set of spending information each year. Last year R&D Magazine brainstormed what else they might do, given all the accomplished people that come to the Awards each year, and they decided to wrap a “technology and technology management conference” around the Awards dinner. The first conference, in conjunction with the awards dinner, was last year. I was invited to speak at the inaugural conference last year at Caesars Palace in Las Vegas. This year, I was invited back to give two presentations. In my mind however, I didn’t think the location would be as much fun. But, I was wrong. The Gaylord National Convention Center is a specially created oasis just south of DC, right on the Potomac River. Many government and military conferences are held at this giant convention center. A small community thrives around this all-in-one facility/town, with plenty of entertainment for traveling spouses. Like McCormick Place in Chicago, this is perhaps another location that professionals should attempt to experience at least once in their career. 2015 marked the 20th anniversary of Christensen’s work on disruptive innovation. In 2016, GGI researched disruptive, radical, and breakthrough innovation. It was time to take a snapshot of how the body of knowledge had evolved over two decades. 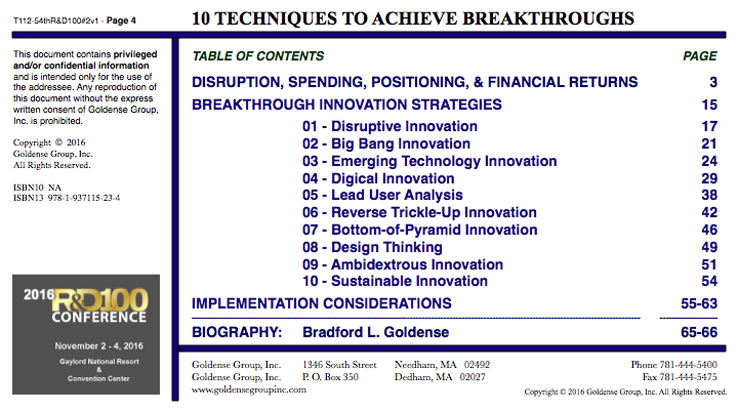 Our work found ten distinct breakthrough strategies. They vary greatly, from competing on business-models to specific market or business strategies to technology mastery to commercialization execution. There is no common root to them, except that your company and industry will know they are experiencing a breakthrough from a new or a changing basis of competition. 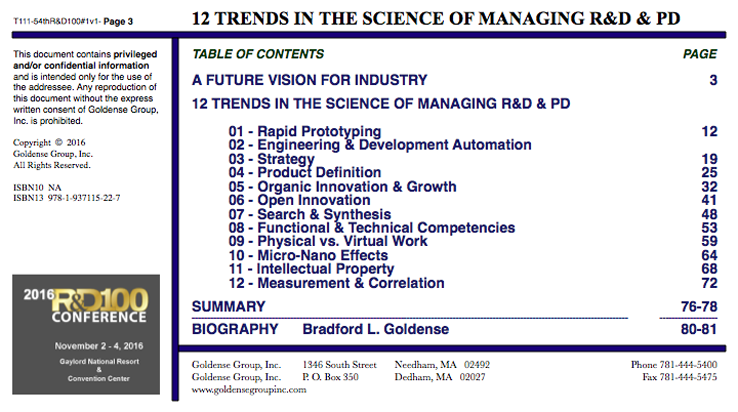 After my presentation on Complexity at the 1st Annual Conference, R&D Magazine asked me to build off it and to make recommendations on how to manage in the decade ahead. I presented this work for the first time at a conference in Poland in April 2016 and further refined it for R&D Magazine. Directing and overseeing science, materials, technology, software creation-to-commercialization activities is already a good bit more challenging this past decade. Well, not to disappoint, we have another tumultuous decade to go. There will be another reset around 2025, once there are 100 billion connected devices and that becomes the new normal. A quick note to let you know that our 21st R&D-Product Development Metrics Summit is coming up. The place is beautiful, the food is great, WI-FI is throughout. This entry was posted on Thursday, January 12th, 2017 at 1:10 am	and is filed under Blogroll, Research, Software, Strategy, Tactics. You can follow any responses to this entry through the RSS 2.0 feed. You can leave a response, or trackback from your own site.